A possible rising star and she is still a dark enough grey that you can see her pretty blaze. Maybe next start open company? Here's the race. Scroll down to Melair S.
Well-Known Fillies Born in 2013 --- pages 1 and 2 has numerous comments about Enola Gray --- she's a beauty and appears to have such potential --- hope she has success on the track --- I love fillies who love to run! I hope so. Open company, maybe even a graded stakes. Don't know why any well known, or much talked about, filly or colt, would not get its own Discussion Thread, especially for continuity. Well-Known Fillies Born in 2013 --- pages 1 and 2 has numerous comments about Enola Gray..
@Especially_Horses --- my apologies --- no offense intended, I was simply referencing other comments about Enola Gray. I meant it to be informational & possibly add to the discussion. I agree --- up an coming colts and fillies should have their own discussion thread. Enola Gray certainly seems to to qualify --- as I said, I love fillies who love to run! You know, I've been a member of the Zenyatta Website/Forum for a number of years now and try to "catch up" with the discussions a couple of times a week. I only post comments when I want to join in the conversation. Perhaps I misunderstand --- is posting only for a select few? This is the third or fourth time I have felt like I overstepped my "boundaries" by simply posting information. Bluebetty, I wouldn't worry about your posts. Don't soft step around; sometimes responses from others are just direct, and not meant in any personal way. My take. Please keep doing what you do. Now I feel, bad. I wasn't offended one tiny bit...was only adding my thought to explain "my action". There is room for discussion and comment on all subjects wherever one wants to post. But nice too that Songbird, Rachel's Valentina, Hope's Love, and now the interesting filly (not so sure how well known she is yet, haha) have a thread explicitly for comments on them (don't know if there is one for Cathryn Sophia). Not sure how you came to the conclusion that "posting might be only for a select few".....would be a boring forum if that were true. Thanks bleubetty for your contributions. Hope to see more comments from you. Thanks @QueenZFan22. It looks like she was just on cruise control the entire way (and into the stretch until she was whipped). It will be interesting to watch her progress! Bad name in my opinion. Good mare though. I know the naming was a generation thing, but there are questions, including from Eisenhower, was dropping that nuclear bomb necessary to win the war. Perhaps so, but the brave sailors on the Indianapolis, three quarters of whom lost their lives, and the crews of the Enola Gay and the Bockscar who bore an awful burden, but dutifully followed the orders that would end WWII, deserve to be honored for their service and to be remembered. Perhaps whoever named this filly is honoring a family member involved in this operation. This was an extremely closely held secret at the time, although upon their return, the crew members were hailed as heros. The decision to use the atomic bomb and to bomb two sites was and will remain controversial. However, the men and aircraft who participated in the bombing mission were not, nor should they be remembered as such. The controversy should be focused where it belongs with the government and military top brass. My father and uncle served in the pacific through most of the war. I am as proud of that as I am of them. Were it not for this mission, my relatives and those of many others throughout our country might not have made it home at all. The Japanese fought a very effective war in the Pacific. Let this filly carry her name proudly and do her name proud! 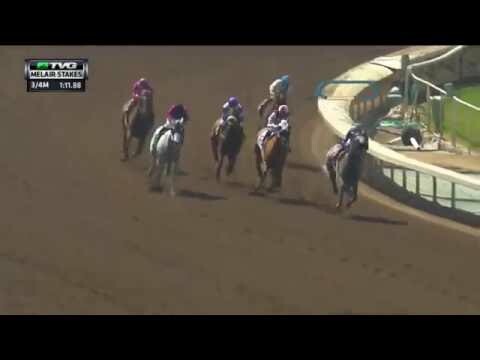 Enola Gray finished 1st by 7 3/4 lengths, on July 22, 2016, at DEL MAR in Race 7. It was the Fleet Treat Stakes. She was the heavy favorite. Time for this gal to move up to graded stakes company, or at least into open stakes. Or maybe they want her to be the CA version of Pepper's Pride? Enola Gray is entered to run on August 28, 2016, at DEL MAR. Purse: $ 100,000. For Fillies, Three-year-olds. By Subscription Of $100 Each, Which Shall Accompany The Nomination, Closed Thursday, August 18 With 15 Or By Supplementary Nomination Of $1,000 Each By Closing Time Of Entries, $1,500 Additional To Start, With $100,000 Guaranteed, of which $60,000 to first, $20,000 to second, $12,000 to third, $6,000 to fourth and $2,000 to fifth. Weight 124 lbs. ; Non-winners of $60,000 at one mile or over allowed 2 lbs. ; of such a race of $40,000 in 2016, 4 lbs. ; of such a race anytime or $30,000 any distance since March 1, 6 lbs. (Maiden and claiming racing not considered.) A trophy will be presented to the winning owner. One Mile. Excited about this. Think she is up for the challenge. Still don't like the name, albeit my problem. Want her to do great! I don't like her name because being a pun, it's supposed to be funny, and it's not. I find it disrespectful. Not her fault though. Temporary setback. Mucuous in respiratory system.